Getting here is surprisingly easy! 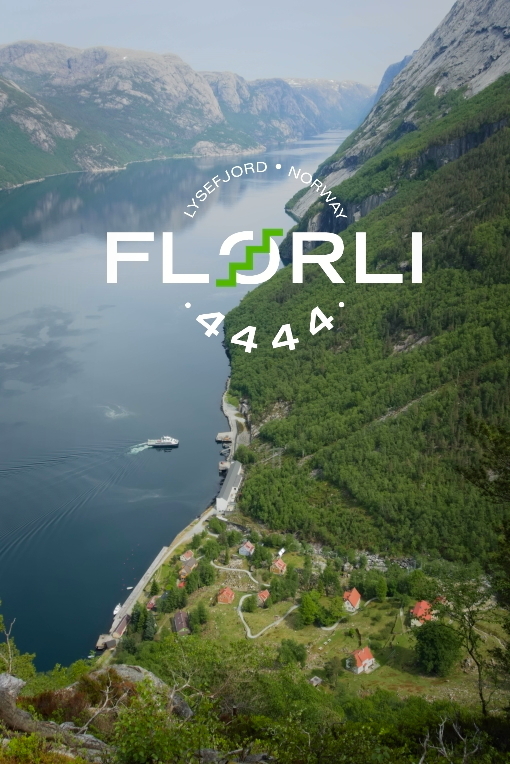 Flørli is only accessible by ferry, with your own boat or by hiking across the mountains. There are two ferries, four daily calls. You can bring your car on the ferry or leave it on the quay in Lauvvik, Forsand, Songesand or Lysebotn. If you bring your car, you can park it on the quay in Flørli, but there’s no parking at the accommodation itself. Groups can charter a boat, see under Events. Read about how to visit Preikestolen and Kjerag from Flørli. Kolumbus (MS Lysefjord, a fast ferry, takes 10 cars): read schedule / book online or call +47 916 52 800. Passengers can buy tickets on board, but we recommend both passengers and drivers to book online. (Phone number captain, last-minute only: +47 480 17 240) Season: all year, not saturdays. Monday, Wednesday and Friday 13:00 direct Kolumbus ferry to Flørli leaving from the Fiskepirterminal in the city centre. All other days: go to Sandnes then Lauvvik, or Tau then Forsand. The ferry goes back from Flørli to Stavanger every Monday, Wednesday and Friday at 7:35, arriving at the Fiskepirterminal at 9:00. The airport shuttle Flybussen departs from there every 15 minutes and takes 25 minutes to the airport. You can also book a guided tour to Flørli with pickup from Stavanger, see my travel tips below. There are many busses and trains between the cities of Stavanger and Sandnes. From Sandnes, take bus 47 to Lauvvik or drive yourself along RV13. Bus 47 drives Monday – Friday, about every 2 hours. Outside summer also on saturdays. Read schedule (norwegian only). You can also order a taxi to get you to Lauvvik ferry quay (about 700kr). Take the busline 100 Tau to Jørpeland. This bus corresponds with the ferry from Stavanger to Tau (Fiskepirterminal). In Jørpeland, switch busses to Forsand ferry quay. There are two services: bus 108, (Monday to Friday only) and Pelles Reiser (all days, tel +47 97526609 / +47 98059117). From Preikestolen parking, we suggest you take Pelles Reiser to get you to the ferry in Forsand. If you need a taxi service, contact Pelles Reiser or Atle Farbrot Bjørlo (tel +47 47506050). Both TheFjords and Kolumbus ferries take you from Lysebotn to Flørli. The ride takes under an hour and you get to experience the magnificent inner Lysefjord. How to get from the Kjerag parking down to the ferry quay in Lysebotn without a car: shuttle bus in june, july and august by Stavanger Baseklubb SBK, 150kr pp one way (too far to walk). See schedule here. You can also easily hitch or take a taxi. Taxi providers: Kjerag-Lysebotn Camping & Resort and Hauane Bed & Breakfast. To Flørli on a daytrip is easily organised with a local guide – right from Stavanger city centre! If you book through our site, you get the best deals! Click here. Car? Bringing your car to Flørli only makes sense if you have a lot of luggage or you plan to travel on to the other side of the fjord. Otherwise, I recommend parking it for free in Lauvvik, Forsand, Songesand or Lysebotn. No car? Take the monday, wednesday or friday Kolumbus ferry leaving Stavanger at 13:00. Then stay two nights or the weekend in Flørli and return directly to Stavanger monday, wednesday or friday morning 07:35, with arrival Stavanger city centre at 09:00. The Flybussen airport shuttle departs every 20 minutes from the ferry terminal and takes about 25 minutes to the terminal. Book ferries. Capacity on board is limited. Though tickets can be purchased on board spontaneously, I recommend to book ahead so you are guaranteed a space. Off-season you also need to book upon leaving Flørli, to make sure the ferry calls port. Come to Flørli to visit Flørli! If your main objective is to visit Preikestolen or Kjerag – chose a different place to stay.